AffordableDrugs.com is a licensed supplier of medications operating from Canada. The store says that it has provided thousands of customers across the globe with their required medications and achieved a high level of satisfaction. Affordable Drugs claims to make sure that its customers are provided with the fastest platform of ordering drugs and to make their experience of online shopping worth remembering. Affordable Drugs also aims to excel in accomplishing the requirements of the Accreditation Organization of the industry. A broad range of medications is offered at this store in order to fulfill the needs of all types of customers. 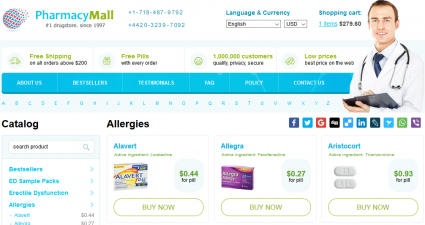 Different varieties of both over the counter and prescription drugs are available at AffordableDrugs. The prices of each of these drugs are competitive to those offered by a local pharmacy store. The store also presents a team of qualified professionals in order to entertain all the queries of the customers regarding their health. 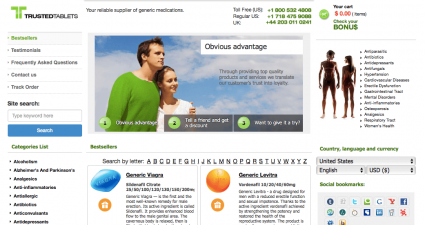 I checked the prices of generic products at this website and found them to be quite high with a 25 mg generic Viagra costing 2.62 US Dollars per unit. 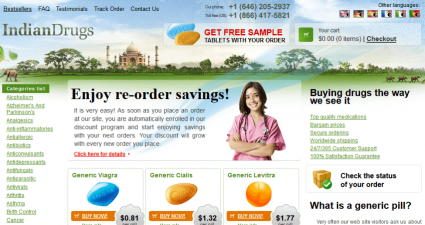 Shipping facility is available for international customers at AffordableDrugs. 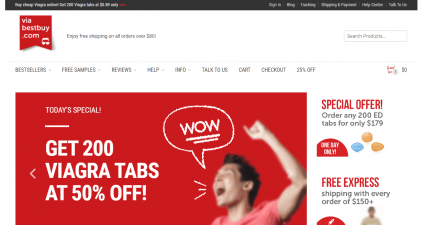 The company has not been specified but the general rule is that the delivery process costs 10 US Dollars for all orders below the total net worth of 100 US Dollars. On average, 7 to 10 days are required for an order to get delivered to its destination. Up to 3 days are required for processing of the order after which they are dispatched. Every order is guaranteed to reach its destination in 21 days to the maximum. Money Orders, Visa Card, Master Card and cashier’s checks are accepted at BlueSkyDrugs.com. Refund can be availed within 30 days upon facing dissatisfaction. For contacting the customer support center, customers are giving an option to call at 1-800-887-6890 or fax their prescriptions to 1-800-281-1789 for free. There were a few reviews I could find about AfforableDrugs.com on a famous reviewing website. One of the reviews was made by Stan Smith who has given 5 stars to the drug store. He has said that the link usually provided for this store is “incorrect” and redirects to a totally different pharmacy. The same customer has also given another comment in which he said that he was looking for a particular drug for his dog which was not available in the United States. The particular drug was available at this drug store, that too at cheapest prices. He said that the store had a “great customer service” with “great prices”. Stan also said that he was “satisfied” and that this store is “highly recommended”. After analyzing the comment, I can say that Affordable Drugs is a good platform for buying low priced drugs. However, this is only one comment and I cannot decide about this pharmacy based on one review only and would need more proof. Because there were no published client reviews made by customers for Affordable Drugs in the year 2016, I decided to check Scamadviser. As per Scamadviser, Affordable Drugs has been regarded as a high-risk website. It has, in fact, been red listed by Scamadviser with a note that says that this drug store is based in the United Kingdom but is said to be working from the United States. It has also been associated with several viruses and has been termed as a pharmacy not safe to use. LegitScript supports the decision made by Scamadviser by saying that it has failed to meet the verification standards provided by LegitScript. Therefore, the store has achieved the status of ‘unapproved’ and the customers have been asked to be very careful about not using this store in future for their own safety. Affordable Drugs does not seem to provide adequate opportunities to its customers for receiving discounts. I was unable to find any discount deals that offered drugs at reduced prices. Moreover, there were no offering of free pills or any offer of such sort. The only thing that I was able to find was a free shipping offer to orders. However, it was not cleared by the pharmacy whether this offer was for all the orders or there were special conditions applied in order to avail this discount. Whatever the reason might be, this offer is clearly not sufficient to pool in more customers. AffordableDrugs.com seems to be a legit website with all the necessary information provided on its official website. I must say that the prices are genuinely high and the company should have taken action to either reduce it or to introduce some kind of discount offer in order to provide compensation for it. Scamadviser has detected some kind of risk with the working of Affordable Drugs while LegitScript has clearly regarded it as an unapproved pharmacy for buying drugs. Therefore, I will also direct the customers away from this store by giving it 2 out of 5. Clients must choose it at their own risk as this store has been disapproved for buying any kinds of medications. I will never buy ED brands from this store before confirming further about its legitimacy.